During the summer vacations we visited Denmark. At one store I bought a book about Danish colonies around the world! One of the colonies was in the West Indies, on the today’s U.S. Virgin Islands. This former Danish colony was sold to the U.S. under one hundred years ago. 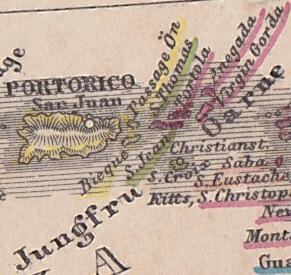 The Danish West Indies islands are marked in green in this map from the school atlas of my grand grand father. Today Danish is not spoken on the islands, except if you happen to encounter a tourist from Denmark.